I recently was contacted by a fellow English language teacher about promoting a book he wrote. I'm always happy to help and will buy it and review ( Teaching with Chopsticks: TEFL from the frontline ). 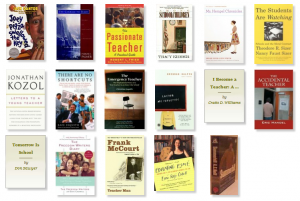 However, it got me thinking about books by teachers about their own classrooms and teaching. Got me thinking about the list I give out to my "teachers to be" each year and also the books I really love in this genre. See my list below and please comment and add your own recommendation. A book written by a teacher that is autobiographical, about their life and times as a teacher. No essays, no philosophy and rants about the educational system - just relating what happened to them as teachers and how they felt about it. One of the "homerun" books that really got me to be a teacher was A.S. Neill's Summerhill (get a preview copy here in our Essential Books category). He spoke in his own voice and that spoke to me. I felt like I was at the school and stepping through the hallways with him and his students. Here's the list I give to my students to start the year (see many in detail on my Goodreads list). Maybe something will inspire you to do some summer reading!